— Misha, the hostess of a streaming call-in show called "Ask a Black" who sees whole world as a wormhole the only way to clean up this huge can of works is to go all the way back, "back through the portal of history." 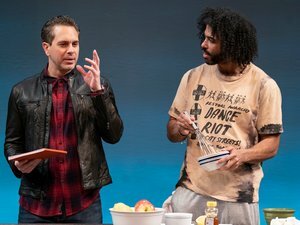 The pivotal character of Suzan-Lori Parks' White Noise, now in its world premiere at the Public Theater is an African-American artist named Leo. But don't expect to see any of his edgy work displayed on Clint Ramos's slick set. While that set seamlessly shifts to the baker's dozen of scenes in locations that include an amazingly effective bowling alley, Leo's emotional problems and the unsettling comment of a teacher when he was in kindergarten have made him unable to get a good night's sleep ever since, and have now crippled his creative muse. His chronic insomnia has Leo often wander the streets at night and it's a traumatizing run-in with the police that does trigger an idea — not for a new painting but for a most unusual temporary role playing arrangement with his friend Ralph. Since Leo's idea drives the entire plot, it's no spoiler to reveal its details in this review. The surprises come from the effects of its actualization on Leo, Ralph and the two female characters which I'll therefore only hint at. If Leo's creator is losing any sleep, however, it's because she's been too busy to keep creating daringly original plays, each with different and often surreal plots, but all exploring the legacy of slavery that still haunts the decendants of both those slave owmers and their human property. For many of Parks' fans (count me in as one of them) any newly scripted play or newly staged revival of a little known or favorite early work is a must-see. Though some would wish she would have put off White Noise, in order to move forward with the next of two additional installments of her epic Civil War drama Father Comes Home From the Wars (parts 1, 2 & 3. As it turns out, White Noise is very much a play that should be seen now that Donald Trump and his followers have caused racism to be more than ever a present as well as a haunting reminder that we are all descended from those plantation folks who owned and were owned. It actually has quite a bit in common with the Pulitzer Prize-winning Top Dog/Underdog The titLe is both richly symbolic and realistic (There are actually white noise machines to ease people's sleep, and Ralph at one point buys one for Leo). As for the master/slave relationship Leo initiates, it's very much a top dog/underdog setup. Besides Leo (Daveed Diggs), the quartet includes his current partner Dawn (Zoe Winters), a lawyer dedicated to do-good work, the rich college teacher Ralph who now lives with Misha (Sheria Irving), the star of a popular streaming call-in show called "Ask a Black." The several excerpts of Misha's show, projected onto a large upstage screen by Lucy MacKinnon, provide some of the play's most trenchant humor. To convince his friends to take his plan seriously, Leo used realistic, can-do-ism. He hired a lawyer in Dawn's office to draw up a contract with a clause for a payment of $89,000 to Leo that will legitimize the arrangement and also wipe out Leo's college and credit card debts. While you may think I'm being a spoiler to reveal what Leo's idea is, that wish to deal with his anxiety and anger is what White Noise is about. The real surprises, which I'll therefore only hint at, pertain to what happens after once his fantasy is actualized. That's when Ralph, and the women sign on — and so will you, despite quite a few credibility defying and too contrived and under-developed plot elements. Thanks to Oskar Eustis's crisp direction and the fully committed performances, White Noise will indeed shake you up and make the three hours pretty much fly by. Daveed Diggs who first charmed me as the Marquis de Lafayette and Thomas Jefferson in the Public's juggernaut musical, Hamilton, is ideally cast as the cynosure character. His interpretation of Leo's troubling emotions, prove that he doesn't need fancy costumes or songs and dances to touch your heart. But the rest of this quartet make equally strong impressions and since the play is structured to zero in on the various back stories, all get their time in the spotlight. And speaking of those monologues, these are so beautifully written and enlightening, and vividly delivered that they overcame my usual lack of enthusiasm for this form of actor to audience communication. Unfortunately the previously mentioned plot contrivances and inconsistencies do mount up. Consequently what could be a great play is at this point something of a literary crazy quilt — a quilt in which some of the pieces have the thread left hanging to be tied firmly together eventually. But then maybe Ms. Parks intended viewers to fill in those loose patches with their own feelings and thoughts.